Nearly two days into freshening charge? I am using a 12v 2.5 Amp automotive battery charger to freshen charge new Crown batteries (6 volt, 220 AH). Is it usual that they should take already nearly 48 hours with still no sign of conclusion? They have of course come all the way from the US to NZ under conditions I have no way of knowing, and even how long they have been sitting at the distributors before delivery. 760W panel array, 4 x 6v 220 ah Crown batteries, Tristar TS-45 PWM controller, no name 600 PSW inverter. Have you checked the specific gravity and resting voltage of the batteries? And what is the voltage and current while charging? I would have expected then to be full charged by 24 hours (if over 75% state of charge... Which it should have been). A 1% rate of charge is less than the 5% to 10%+ recommended charging rate. My suspicion is that the distributors are selling old stock at discount. That's why I got them cheap. I have now taken them off charge and are waiting for them to settle a bit prior to the tests you mentioned. 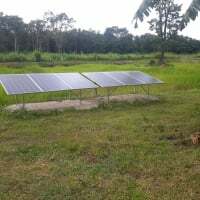 But when I first tested them after delivery they were sitting at approx SG 1230 so thought it prudent to charge them the conventional non-solar method. Crown are recommending "3 to 6 amperes per 100 ampere hours of the battery’s rated capacity) for approximately 3 hours". My suspicion is the charger is too small to do the job, my 30A automotive 12/24V charger states a minimum / maximum capacity that cam be charged, When batteries have been stored for extended periods of time, sulfation sets in, this would require a fairly rigorous charge to break down crystals, additionally they may need to be equalized after full charge is achieved, none of which is possible with a 2.5A charger. Typically, 2.5 to 5% would be the minimum rate of charge for equalization. For charging, 10% is the recommend minimum rate for normal charging. The 2.5A charger would likely be regulated to ~14.4V, which is insufficient to equalize, 15-16V would typically be required. Getting readings on all 6 cells just below 1300 SG. I guess not bad. Should I equalize these batteries? I have a cheap PWM controller and it is supposed to have an equalize mode. Therefore maybe I should connect to PV via the controller and try it out? What is the difference between the high and low SG cells? 25 points max. Terminal voltage is 12.91. Isn't that a little low? (But I am using crocodiles until I get proper cables). So maybe that accounts for it. What is your interpretation of terminal voltage ? The SG spread is not too high, they may benifit from an EQ, usually an EQ is performed on a new bank even if known to be good, this is part of the commissioning, it brings all cells to equal voltage which prevents cell drift. what are the date codes, this will establish how old they are, from the sounds of it they may be in ok shape especially if the small charger had some effect. My 85 ah measures 13.2 fully charged unless with bigger batteries the voltage is spread out to accommodate. If that is so 12.91 might be ok. But I will get proper cables before determining that. Is that voltage taken immediately after charging or after a few hours which will allow the surface charge to dissipate? Depending on what manual you read from Trojan, they recommend EQ when the difference is 0.015 or 0.030 between high and low cells. In any case, log cell sg's after EQ is done, and that is your new 100% state of charge. Actually, the 85 ah might have been too soon after charging, so it's quite possible that the 225's voltage is more to the norm as they had about 4 hours before measuring them.